It appears that Prime Minister Vladimir Putin has found the secret to winning the hearts and minds of voters: invade their territory and install a corrupt pocket government. In the midst of widespread allegations of voting fraud by Putin’s United Russia and massive protests against the authoritarian Putin, the government has announced that United Russia secured a whopping 99.48 percent of the vote with 99.51 percent of the citizens voting. Of course, the chances of Putin discovering votes in Chechnya is about as likely as finding two ancient artifacts lying in the open on the ocean floor in his first scuba diva. Political analyst Vyacheslav Nikonov had a great response in observing “I haven’t heard about results like that since the Soviet times.” Precisely. Despite the embarrassing campaign by the government to create a cult of personality around Putin, many Russians (including Gorbachev who accuses Putin of “castrating” democracy in Russia) have recognized him as an enemy to democracy and a tyrant — despite China’s selecting Putin as its Peace Prize winner. Military police are flooding into the Moscow after thousands protested the election results. Over 50,000 troops and helicopters have been brought in by the government, which says that unapproved protests (expected Wednesday) will be suppressed. Putin and his party barely held on to power despite widespread fraud and the shutting down of election monitors on the eve before the election. Russia launched an investigation into the country’s chief independent election watchdog and, in his acceptance speech, Putin lashed out at these organizations are fronts for foreign governments — an ominous sign that suggests that he was already planning to steal the election. He accused foreigners of funding his political opponents — a repeated theme from 2000-08 presidency. It was inspiring to see Russians of all ages take to the streets to chant “Russian Without Putin.” They have contradicted the view of some that Russians have an innate preference for strongmen leaders. This could be the last chance for civil libertarian and freedom-loving Russians to fend off the building dictatorship around Putin. 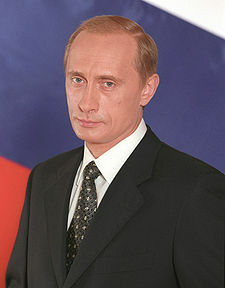 Gorbachev has come out to call for a new vote, but Putin denies the allegations of fraud and has called in the military. It is now clear that many Russians will refuse to go quietly into that night. While Putin is likely to crush the opposition, it would be wonderful to have him return to his career as an underwater archeologist. FLOG THE BLOG: Have you voted yet for the top legal opinion blog? WE NEED YOUR VOTE! You can vote at HERE by clicking on the “opinion” category. Voting is open until December 31, 2011. Does anyone have a link to a legimate source mentioning this statistic? I’m writing a paper now on ethnic division within Russia and would love to use this as a supporting point. Thanks! Based on the repubs redistricting and attempts at voter suppression Putin is obviously their role model. One of the reasons for Putin’s landslide was a printing error on the ballots. The name of Putin’s opponent, Mikhail Bakunin, was mistakenly printed as “Michele Bachmann”. Man” mindset that only morphed from Tsar to Premier in their Revolution. We instead backed the old party members and their criminal underworld to gain power, while pillaging for what economic benefit could be had, so the country hasn’t changed much. he is just another egotistical Russian “Strong Man” in the mold of many, many before him. That is so Kentucky, home of McConnell. So now we know where the Karl is running campaigns…Rovmaina….sorry wrong country…. This is yet another “success” of the neo-con foreign policy brain trust. When the Soviet Union collapsed there was a debat about how we should help enable democracy & the neo-cons won. Instead of actual help we held them as suspect, treated them as potential adversaries and attempted to manipulate the economic resources of the country while ignoring the political realities. If we ever get past our Muslim paranoia the old Soviet Union will be there for us to ‘fear’ so we need a huge DoD budget. It looks like Russia is returning ti it’s Soviet Union ways!